So here it is. Eight songs that won’t probably change your life. But at least it might make you feel less ashamed of your own secret music choices. I mean, do I have to justify this to you? Love this song. I also have a thing for Rihanna (who doesn’t?) Believe me, the beat is awesome for running. It is obscene how many times I have listened to this song while running. IT.JUST.WORKS. I’ve very ashamed to admit this. I get super pumped at the key-change though. Alright, I’m little embarrassed about this one too. But it’s the best for running, it’s got a driving beat and enough attitude to keep you pushing hard. You might not recognize this one by name, but if you heard it, you’d probably know it. This one was popular when I was training for my very first Ironman, so I have a soft spot for it. This song goes ridiculously well when you’re sprinting. It’s a classic and a very good one too. I know, I know, the Bieber...but the hook is infectious, the tempo is perfect, and there’s something about this one that can pull you out of a funk like no other. Now that I’ve come out of my workout musical closet I can tell you one thing I’m not ashamed of. It’s so delish AND legit AND solid. Very tasty and very simple to make. Perfect after a grueling workout. 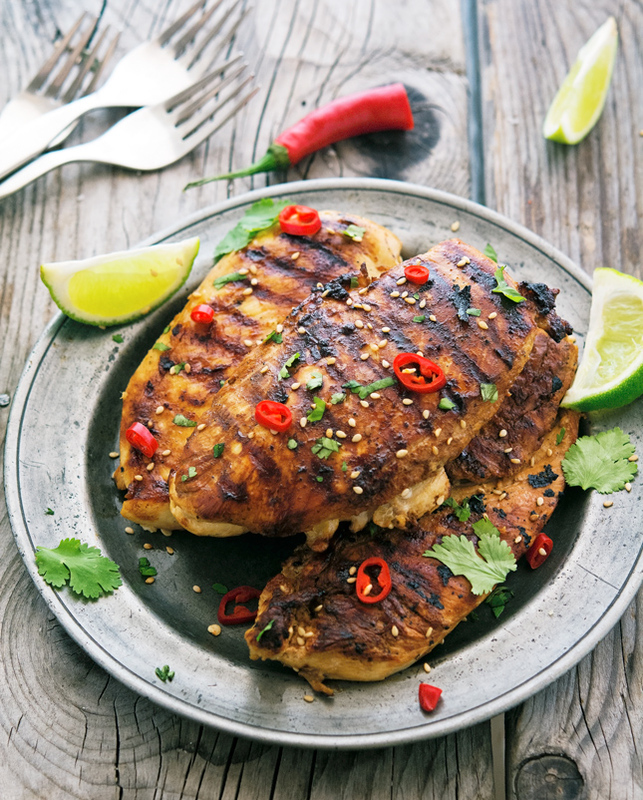 A simple marinade of soy sauce, fish sauce, ginger, garlic, lime juice, and lime zest is all you need for this delicious grilled chicken. You can really taste the ginger and garlic. It’s not overpowered by the soy. The fish sauce brings salt and umami into the mix. Just like my power songs. HA! 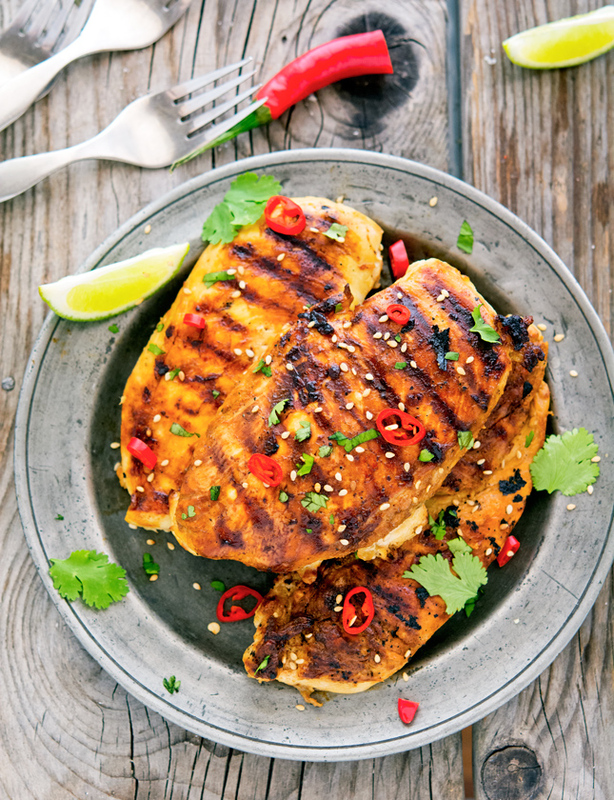 Grilled Soy-Lime Chicken Breasts Print this recipe! Place chicken breasts between two sheets of parchment paper. Using a mallet or rolling pin, pound each chicken breast to an even thickness of about ½ inch. In a large bowl, whisk together soy sauce, fish sauce, ginger, and garlic. Grate in the zest of one lime and the juice of one lime. Whisk in vegetable oil. Add chicken breasts, cover, and marinate in the fridge for at least 1 hour (marinate overnight for fullest flavor). Grill until undersides are browned and chicken is about halfway cooked, about 5 to 6 minutes. Flip breasts and grill until chicken is through, about 5 to 6 minutes more. Transfer chicken to a platter. Drizzle with a bit of olive and lime juice. Sprinkle with chopped cilantro, sesame seeds, and chopped chiles if desired. Serve! One serving yields 362 calories, 12 grams of fat, 5 grams of carbs, and 56 grams of protein. I am dying over here. Just kidding. Eye of the Tiger...yup, old Marching Band piece from the 80s. Love the old Van Halen songs too. The chicken looks amazing! Van Halen is VERY GOOD indeed! YES to Rihanna and Kelly Clarkson (have no shame). And Eye of the Tiger is a classic! Hahaha! You are a brave one Mike - I don't think I would admit to listening to anything by the Beebs! The two on my ipod accidentally transferred over from my daughter's playlist - promise! But, I will admit to loving this chicken - ginger and garlic are two of my staples - with that fish sauce -this must have been killer! "Accidentally"...you're such a liar Shashi!!!! Hi Mike, you are so funny, and I mean that in a nice way. 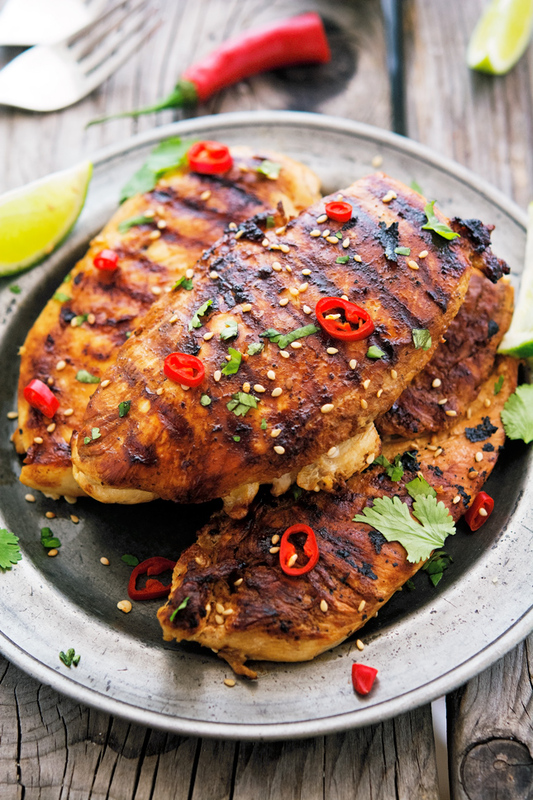 Anyway grilled chicken is one of my favorites, love the marinade. I'm thinking that fish sauce addition takes it to another level... this looks mouthwatering. And how brave of you opening up about the motivational tunes! So here I go myself with my top 5, yep Rihanna is in there! Those are some pretty rad songs Kev. I'm a big fan of Depeche Mode too! Hahahaha Mike, you're a riot. This post cracked me up! Indeed, that's true about songs. I've got some I always listen to. Basically, I can easily listen to one song, over and over, for an hour or so. That really helps. But the difference is there is nothing to be ashamed in my list. And yours...yup...embarrassing. Hahah, just teasing. But at least you shouldn't be ashamed of this delicious chicken. That's the only thing that matters. I'm not embarrassed anymore Ben, I've just confessed to listen to the Beebs, that's like hitting rock bottom! haha!! loved reading your workout play list! I need fast, upbeat music .. usually Beyonce, Maroon 5, Taylor Swift or whatever. . good beats .. fast pace and I'm good!!! and love this flavor combo on the chicken!!!! love!!!! Second that Alice. Beats + pace = perfection! I would hate to have my kids look at my workout music list! But I do go for the beat. 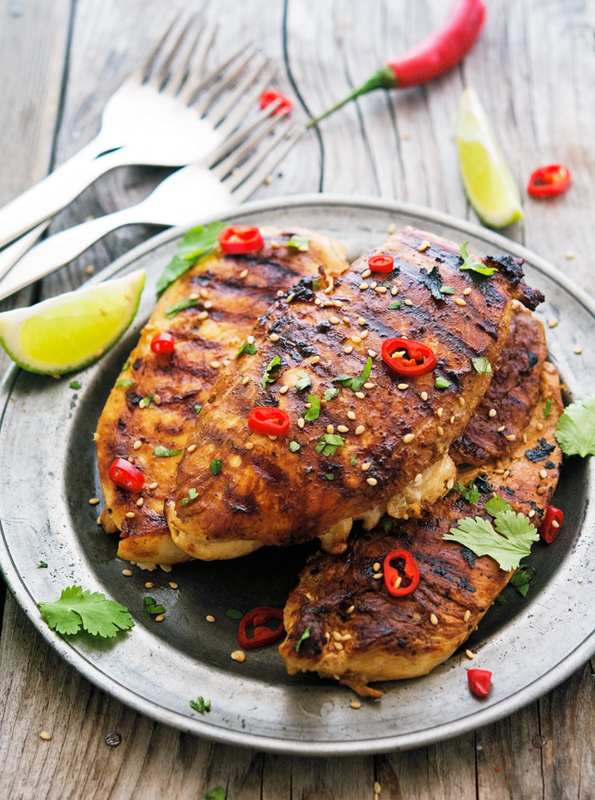 Great looking chicken and a marinade full of flavor. Nice presentation! I'm wolf enough to handle the Bieber, I hope you'll be too one day. lol! The recipe looks yummy. If I have a fish allergy in the house, how would you recommend omitting the fish sauce? Replacements?